The PC is way more powerful than any games console. For proof, merely regard the ludicrous complexity of the latest high-end graphics chips. There are probably more transistors in a single AMD Radeon HD 5870 graphics card than a whole XBox 360 or PS3 console, including CPU, GPU, memory, the lot. We're talking orders of magnitude difference here, people. 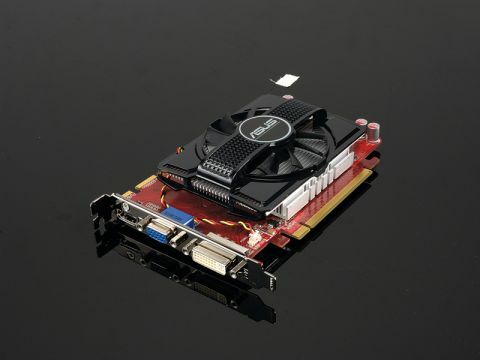 In a way, however, it's actually more modest cards like this Radeon HD 5670-based board, the Asus EAH5670 1GB, that really drive home the PC's superiority. The 5670 doesn't even qualify as second string in the hierarchy of AMD's new DX11 3D chips. Effectively, it's a quarter of a Radeon HD 5870. So that's 400 stream processors, 20 texture units and eight render outputs. And yet it's still roughly twice powerful as any console GPU. All of which means it copes just fine when you bung a thinly disguised console port at it such as Call of Duty: Modern Warfare 2. At 1,920 x 1,080 with 4x anti-aliasing and most of the settings cranked up, you're getting much better visuals than the console equivalent, too. Of course, a high fidelity PC game like Crysis: Warhead is a different bag 'o pixel shaders altogether. Put simply, you'll need to switch off much of the eye candy to achieve playable frame rates. Meanwhile, if you're wondering what marks this particular Radeon HD 5670 board from the rest, the answer comes down to cooling. Asus claims to have created a cooler that's impervious to dust and works effectively for longer. If you can believe it, the result is 25 per cent longer operating life. Elsewhere, there's little to report. The EAH5670 sticks to AMD's reference clocks at 775MHz for the core and 4GHz for the 1GB of GDDR5 memory. But we're just fine with that. Overclocking a card as cut down as the 5670 is futile. Better to reap the full power efficiencies of its relatively modest architecture. A world-beating pixel pumper the 5670 chipset may not be. But there are upsides to its relative lack of graphics power. Asus's EAH5670 is not only very compact, it's an extremely cool and quiet runner. Indeed, it doesn't require any external power connectors and will therefore drop into a wide variety of PCs. If you're looking for a card with reasonable gaming prowess for your small form factor rig, look no further. The 5670's other significant plus point is support for DirectX 11. Microsoft won't be releasing a really major update to DirectX any time soon. So you can buy in confidence that full compatibility with the latest games is a given for a few years to come. DX11 support also means you can make the most of the Compute Shader. Granted, we remain dubious about the whole idea of running non-graphics software on 3D cards. Despite the hype, actual apps remain vanishingly rare. But if general purpose processing on the GPU ever takes off, this card is ready to unleash its console-crushing parallel power. In a word, performance. That's not to say this board is a complete blow out. However, even in relatively undemanding games such as Call of Duty 4, it only just manages smooth frame rates. You've absolutely no performance in hand for the future. As games inevitably become more demanding, we suspect the 5670 chipset will begin to chug badly. Full DX11 support, 400 stream shaders and 1GB of memory – that's an impressive package for well under £85. If you're on a tight budget and future compatibility is your bag, the Asus EAH5670 1GB is for you.